At ArtFactory.com we specialize in the rarest, and most highly collector sought after vintage Americana. 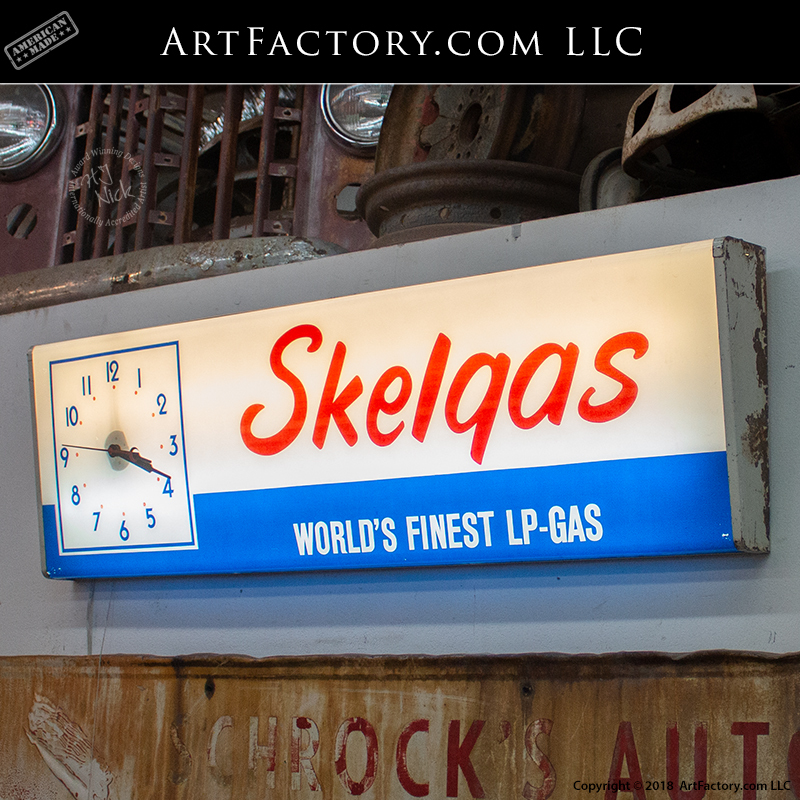 This rare Skelgas lighted clock sign is not only extremely rare, but is in fully working condition. We have completely rebuilt the electrical and the housing is completely original and untouched in order to save the story. The faceplate of the sign features a two tone background that is white on the upper half, and blue on the lower half. The sign has "SKELGAS" in large, red, script style letters on the upper part of the sign, and "WORLD'S FINEST LP-GAS" in smaller white lettering on the lower half of the sign against the blue background. The fully functioning clock with hour and minute hands is a square area on the left edge of the sign. This Skelgas lighted clock sign is in original, unrestored condition as we believe all Americana should be kept when possible. It the perfect display piece for your man cave or automotive business. Never settle for low quality reproductions when you can have the genuine article. Authentic, original vintage porcelain signs and petroliana have investment value that reproductions never will. All of our collectible signs, restored vending machines, and museum quality vintage visible gas pumps are real, authentic Americana with future appreciable value. Furthermore, all of our museum quality restorations are fine art quality certified by award winning artist H.J. Nick. Our restorations are the finest quality available anywhere because nobody has been doing it longer, or takes the attention to detail that we do at ArtFactory.com. We have one of the largest selections of collectible vintage Americana available anywhere, and over a century of experience in the antiques restoration business. Call us today at 1-800-292-0008 for pricing on this rare Skelgas lighted clock sign, or any of our other museum quality collectible Americana.